The popular Dubai Ski concept is set to be rolled out across the Middle East, with developer Majid Al Futtaim Group signalling plans for several new facilities in coming years. 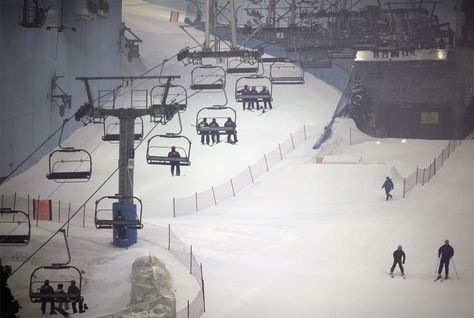 Ski Dubai at MAF’s Mall of the Emirates has become a must-do tourist attraction since it opened in 2005. A unique concept given its location in a hot, Arabian city, it includes an 85m-high man-made mountain with five runs. It has 22,500 square metres of snow, according to its website, with temperatures kept at between -1C and -20C. George Kostas, Majid Al Futtaim CEO of Properties, said as part of MAF’s expansion plans, which was estimated by MAF chief Iyad Malas at $5bn over the next five years, it aimed to replicate the Ski Dubai concept around the region. MAF is already building a version, known as Ski Egypt, as part of the under-construction Mall of Egypt in Cairo, which is due to open in 2016. “We’re looking where else we can take it,” he told Arabian Business on the sidelines of MAF’s rebranding launch. Kostas had earlier told media that the company’s rebranding, in which all of its diverse group of companies will unify under one umbrella corporate brand with the symbol “M”, was also a “promise” to customers on the standard of service they would receive from a MAF product. “One of the things that we now need to do with this public pledge to the market is make sure that we are looking across every single asset, every single business and deliver on those promises,” he said. “That will mean in places like Egypt where we’re expanding the Ski Dubai concept… we’re going to look now beyond just Egypt. Malas said despite 20 years of history, the rebranding would make clear that Majid Al Futtaim was behind brands and experiences provided to 250 million customers across the Middle East each year. Its assets included City Centre Malls, VOX Cinemas, Carrefour, Magic Planet, Najm Credit Cards, Ski Dubai and Mall of the Emirates. Malas said the company, which had about $10bn in assets, planned to double in size by 2018, after similar growth over the past two decades, and was in a position to make investments totalling $1bn a year for the next five years. The company’s expansion will be driven by new malls opening in Saudi and Egypt, residential projects in Lebanon, hypermarkets, cinemas, family entertainment centres and snow park openings. Posted on January 28, 2014, in #middleast, #retail. Bookmark the permalink. Leave a comment.